As long-timer readers know, every year for the past decade I took a trip to Portland to sell tankards at a huge event. Last year we gave up our booth space so I'll no longer be going (unless I take a trip to visit friends). But every year, directly across from me, a food booth from a Portland restaurant called The Horn of Africa set up, serving South African cuisine. It was absolutely delicious. I'd never had this kind of ethnic food before, and yowza it was good. They had a particular way of preparing lentils that was over the moon. So, since I'm no longer going to Portland, I decided to look around and see if I could duplicate their way of cooking lentils. 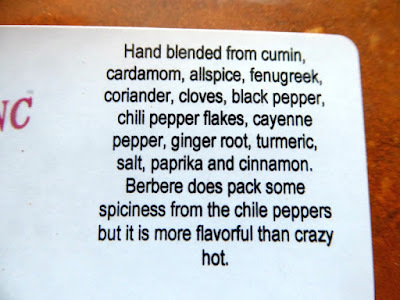 The secret, as it turns out, is a spice called berbere, which is a combination of a whole bunch o' other spices. I decided to bite the bullet and order some. When I opened the spice and took a sniff, I said "Ahhh -- yep, that smells like Portland." Bring a pot of water to a boil. Add the lentils and cook according to the package directions, though leave them a little al dente, as they will simmer in a spiced liquid a little later in the recipe. About 5 -10 minutes, depending on the size of the lentils. Drain the lentils and set aside. In a large saute pan, warm the olive oil over medium heat. Add the onion and cook until softened, about 5 minutes. 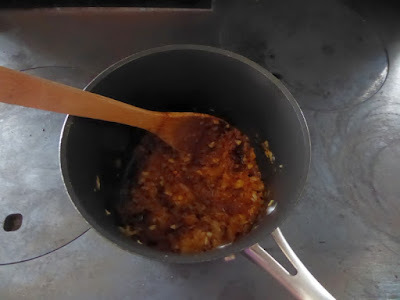 Add the garlic and ginger, cook for 2 minutes. 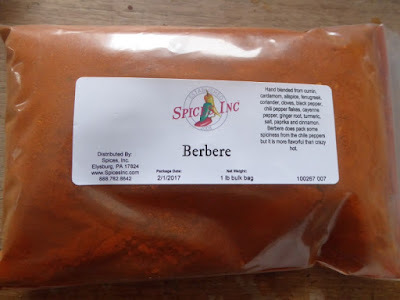 Stir in the berbere to form a paste. 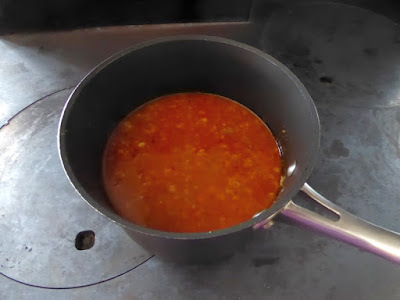 Add the lentils, ½ teaspoon of salt, and water. 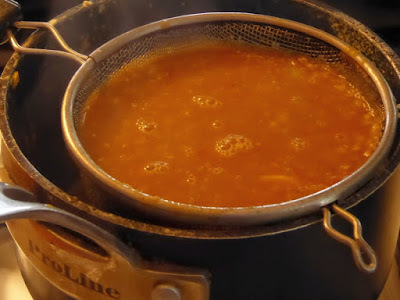 Bring to a simmer for 10 - 15 minutes, until most of the water has evaporated and the mixture has thickened into a stew-like consistency. Taste and add more salt, if need. Finish with fresh lime juice. Garnish with cilantro (if desired) and serve immediately. Enjoy! * I love spicy food! Which is one of the reasons why I love Ethiopian food so much! If however, you prefer something a little more mild, start with 1 tablespoon of the berbere spice mix. 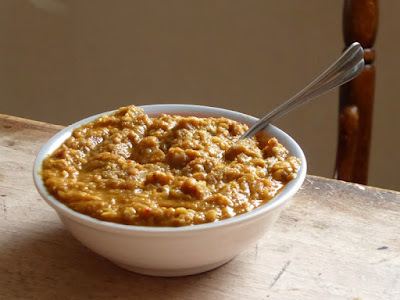 According to the website where the recipe came from: "Lentils come in 3 major colors – green, brown, and red: Green lentils have the strongest flavor of the 3, with a slightly peppery taste. They take the longest to cook, about 45 minutes, and hold their form better after cooking than the other two varieties – which makes them ideal for soups and stews. Brown lentils are mild and earthy in taste. They cook up in about 30 minutes and still hold their form fairly well. Red lentils have a slightly nutty taste and only take 5 -10 minutes to cook. They tend to break their shape fairly easily, so they’re perfect for curry dishes and thickening soups." I bought some red lentils at the grocery store. 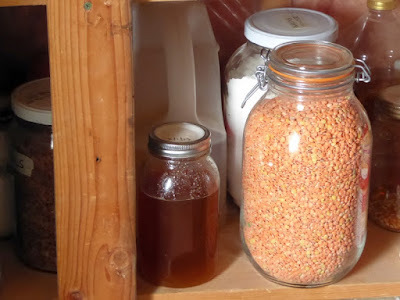 The nice thing about lentils is they're dirt-cheap and über-nutritious (the ultimate prepper food, in my opinion). Here I'm sauteing onions on the left, and boiling lentils on the right. Then I added the spices to the onions -- ginger and berbere. 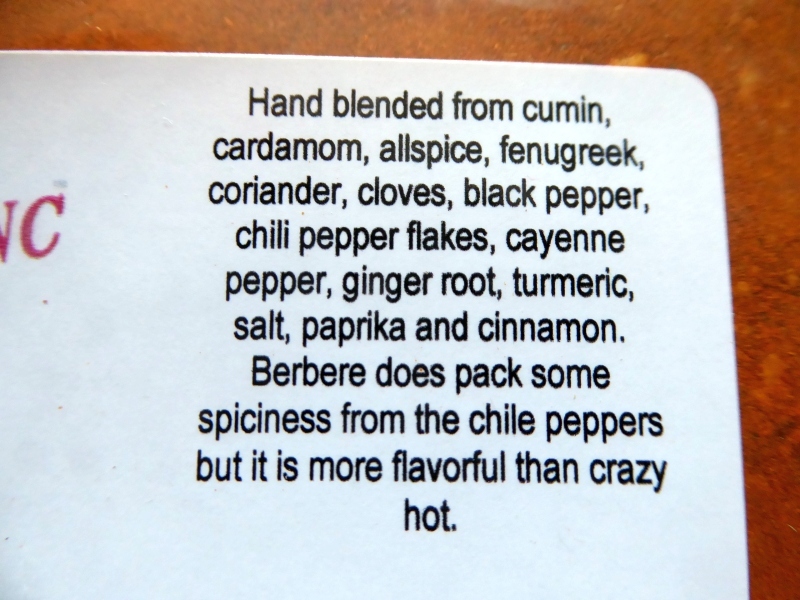 The woman who gave this recipe is correct: two tablespoons of berbere is VERY hot. I compromised and added 1.5 tablespoons and it was still wildly spicy. Next time I'll add just one tablespoon. Here I've drained the lentils, added them to the spice paste, and added the two cups of water recommended. But after that minor glitch, the lentils were absolutely out-of-this-world delicious. A definite addition to our lentil recipe repertoire! Yum! I'll definitely whip up a batch of that spice mix and add it to my red lentils. I'm always cooking them (spiced with bay leaves, cumin, garlic, onion, s&p) and served with a splash of Balsamic vinegar. Lentils are OK, a little bland. For what it's worth Pinto beans (most of the dried beans) are about equal to lentils in proteins, and other essential vitamins and minerals. 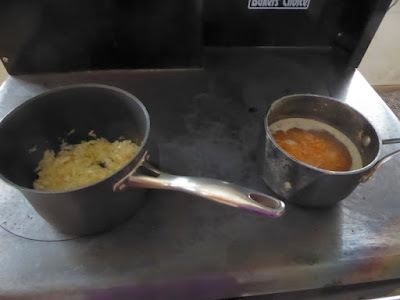 I like all the beans but find the Pinto to be able to do the job and can be a little easier to cook then some of the other beans. Lentils are much easier to cook and I guess if that's an issue that would be a plus for them. It provides a wealth of data on each and every possible food so that you can compare them. Isn't the internet a wonderful device! 20 years ago you would not have been able to find the spice nor the instructions on how to cook it. I do model airplanes and there are sites with thousands of plans that you can now print, in a tiled manner, and tape them together. There have been several instances where you can then talk with the designer. I just did one of these and had a nice conversation with the designer who is 89 years young and lives in England. None of that would be possible without the internet. another side dish or eat them alone. Either/or. I like them both ways. Oh, forgot to tell you I just love your header and so does my grandniece!